A quick setup guide for i3 on Kali. If you're anything like me, you regularly use Kali Linux as a VM or on lightweight boxes with fewer resources than you'd like. I recently switched to the i3 window manager instead of Gnome, and have marked a significant increase in the usability of the VM. I've tried Kali's other default Window Managers (KDE, Mate etc) but for the most part they either look like crap or don't make a big difference to the usability, whereas i3 (for me) is simple, looks decent, and uses far fewer resources. In this guide, we're going to set up i3 on Kali, and get it looking reasonable. i3 is a tiling window manager. This means that, by default, anytime you create a new window (terminal, firefox, etc) it splits the screen, however we're going to set it up slightly differently so that all windows are presented in tabs. 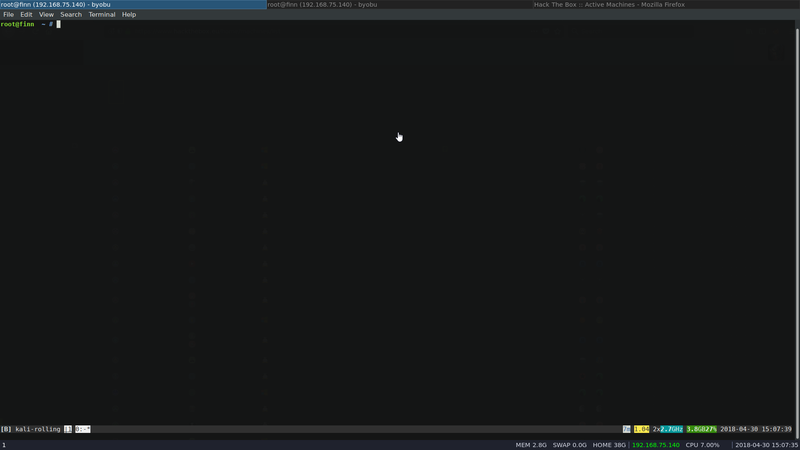 We'll also have workspaces of course, as well as a minimalistic status bar. The final product can be seen below. The first step is to install i3, in addition to a few extras that we'll use to style it. Now reboot and when we go to log in, after entering the username field and at the password prompt a little cog icon appears next to the login button, from here we can choose "i3" and we're good to start! Note that it looks pretty horrible at the moment, but we'll quickly change that. If you get prompted for a default modifier key, the recommended option is windows. This is the key that will be used to navigate tabs etc, we'll go over that later. All the configuration for i3 itself takes place in the ~/.config/i3 folder, mostly the config file. We'll need to have logged in using i3 at least once to have these files created. To start out, hit the modifier key you chose earlier and Enter to launch a terminal. Then add or amend the bar subsection to invoke i3blocks, a much nicer status bar than the default. We can then configure the ~/.config/i3/i3blocks.conf file to alter our status bar, for example commenting the temperature and battery sections, as they're not useful for VMs. We can get this file from the i3blocks github repository, and alter it as we wish. i3 has it's own set of commands, which are quite intuitive and easy to use. It uses a "mod" key which can be changed, but by default is the windows key. To start a process mod+d and start typing process name. A suggestion bar appears at the top of the screen. There are a great set of YouTube videos by Code Cast here that go over some optional extras for i3, such as always launching certain processes (such as a terminal, firefox etc) in a dedicated workspace, or changing the workspace icons in the bottom-left (usually 1,2,3 etc) to font-awesome icons such as the firefox and terminal symbols. Then change the name of the font that's used by editing the ~/.gtkrc-2.0 file, changing the line gtk-font-name="System San Francisco Display 12", where 12 is the font size. If this file does not exist, just create it. We can also run lxappearance and gtk-chtheme. These programs can be used to alter most appearance settings, however they don't appear to notice the new font file so we have to edit the file manually. We may also have to change it in ~/.config/gtk-3.0/settings.ini in the same way, depending on versions used. 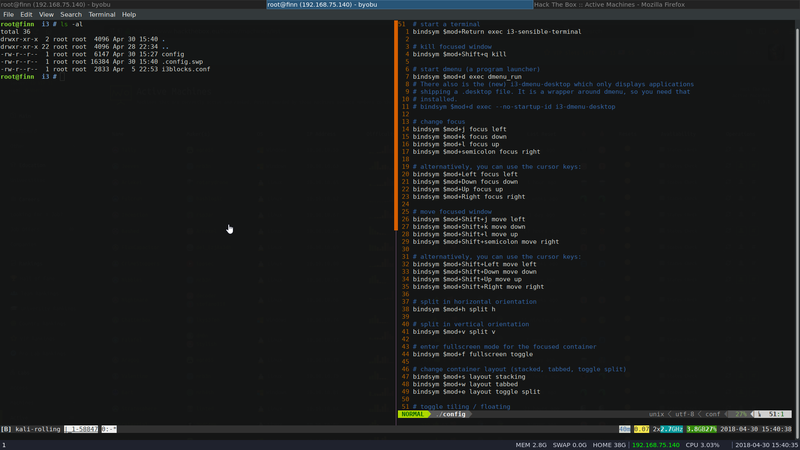 In the above screenshot I'm using byobu as the terminal multiplexer and vim powerline for vim. Both are great tools I can recommend. We can change the default window manager in the file /usr/share/gdm/BuiltInSessions/default.desktop by changing the value of Exec to i3. This will also create a backed up file of the original at /usr/share/gdm/BuiltInSessions/default.desktop.bak. Then when logging in, the i3 window manager is used by default. If anyone finds out how to elegantly handle this, please tweet at me to let me know! We've had a quick look at setting up i3 as a window manager for Kali Linux. We've touched on the usage and some configuration options, but almost every aspect of i3 is configurable. For more details and options, check out the i3 user guide.